You would like to know which InLoox PM version you’re currently using? Or would you like to send us a support request and need the version number for that? This video tutorial will help you find the system information. You can easily find the system information of InLoox PM with a few mouse clicks. First, go to “InLoox PM” in the Outlook ribbon and then choose “Help”. In the drop-down menu choose “About InLoox PM”. Copy the necessary information with a click on the button “Copy Info”. Add this information into an email (support@inloox.com) or a support ticket (https://support.inloox.com/?/Tickets/Submit). 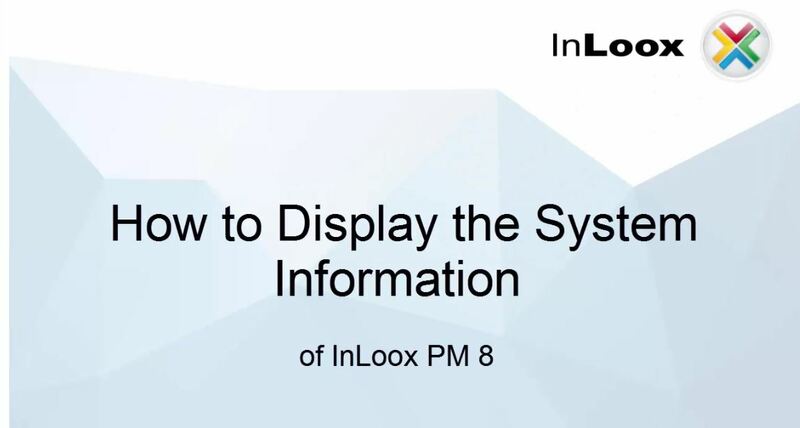 Video Tutorial: How To Display the System Information of InLoox PM8 - InLoox • Copyright 1999-2019 © InLoox, Inc. All rights reserved.